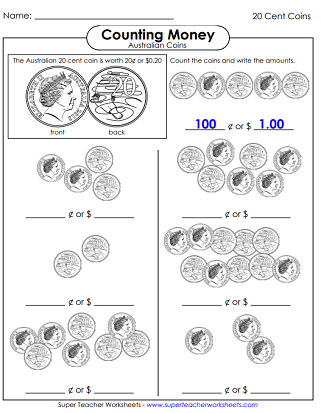 These worksheets, games, and activities feature Australian coins. Students count the coins to determine the amounts. All coins pictured are in Australian currency. We also have US Currency and Canadian Money worksheets. Count the five-cent coins and write the amount two different ways. Count the ten-cent coins and write the amount of money shown. Determine the amount shown for each group of twenty-cent coins. Count by 50s to determine the dollars and cents shown for each coin. Count the Australian dollar coins and write the amounts. Count the Australian two dollar coins and write the amounts. On this PDF you'll find thirty task cards with Australian coins on them. Each card has only 1, 2, or 3 coins. Students must determine the value of the coins on the cards. Determine the money amounts shown. Includes all Australian coins. Game: "I Have / Who Has"
Your students will love this whole-class counting money chain-reaction card game. Here are thirty task cards with coins on them. Students can calculate the value of the amounts shown. Use these for classroom scavenger hunts, math games, or small goup instruction. This file has large, printable pictures of coins from Australia. Includes a five-cent coin, ten-cent coin, twenty-cent coin, fifty-cent coin, dollar coin, and two-dollar coin. This page features maps and worksheets for Australia and New Zealand. 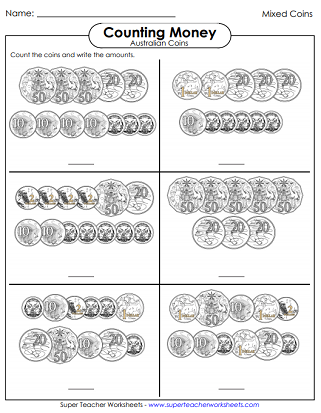 Count American coins and bills with these printable activities. 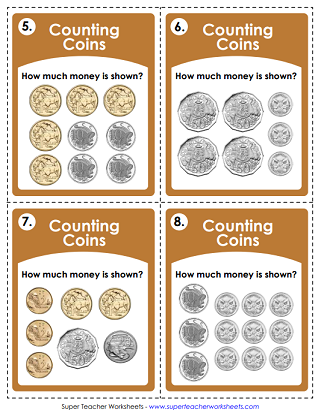 These worksheets have Canadian coins and banknotes.